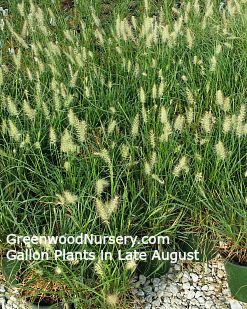 Pennisetum 'Hameln' is one of the most popular dwarf fountain grasses. The Pennisetum ​alopecuroides Hameln's compact growing habit and finely textured foliage make this one of the most popular warm season Pennisetum cultivars. Pennisetum 'Hameln' are grown for their flower clusters that appear in summer to fall, which is earlier than regular pennisetum, and can be used in flower arrangements both fresh and dried. Most species are very frost hardy.